Even though temperatures have plummeted in the Northeast and Christmas decorations are being put out, there was still one piece of unfinished racing business this past weekend. On Saturday, the 32nd Turkey Derby Race was held at Wall Speedway, Wall New Jersey. The weather was sunny and windy but it was a great day for racing. At the beginning of the racing activities two special awards were given. One award for Chuck Steuer who recorded the fastest time for the tour modified cars. The second award for John Blewett, III , for the fastest time in the Wall Modified cars. Both drivers were given a Larsen Brother Memorial award. for $1000 each. When it came time to race, it was all John Blewett, III. The winner of the North vs. South Shootout at Concord Motorsport Park earlier this month dominated the Turkey Derby. He led the race for 90 of the 100 laps and went on to win. “I paced myself and went quick enough so that no one could pass,” said Blewett. “We got concerned when a lot of guys pitted. But we saved enough for the end.” John then took the time to thank all of his sponsors. The team’s strategy to stay out and just race kept them in front of the many spinouts and accidents including the one that caught up Ted Christopher, the race starter. to drive the #41 car. He worked hard to try and win the Turkey Derby, but he ended just shy, finishing in the second position. “This was a one race deal for the Turkey Derby race”, Ken said when he was asked if he planned on any more races in the future. Matt Hirschman came in third in the number 52 modified at the Wall Turkey Derby race with his father, Tony Hirschman, the 2005 Whelen Modified Champion, as a member of the #52 pit crew. “This race was really worth it,” said Matt Hirschman. “This was our best finish here, third. We usually qualify good and then crash. While Matt’s dad was in the pits, Jamie Tomaino was out racing on the one-third oval track against his son Jamie Tomaino, Jr. Father did know best in this battle as Jamie Sr, completed the race in 7th position, while Jamie, Jr. completed the race in the 14th position. Ted Christopher would lead the field to the green. An early flat would send him to the rear. Coming back up a lap 72 incident with Tim Arre would end his day. Donny Lia started tenth. A spin would also send him to the back, but contact later on would send the number 18 to the pits to stay. Eric Beers had a steady day. Recovering from a lap three flat Beers would run steady to finish fourth. track. The #91 car driven by Rich Mongeau won the first modified race. Jimmy Blewett won the second and third race in the strong #77 car, but he had dropped out of the first race with car problems. Because of Rich Mongeau’s strong race finishes he led in points to complete the races as the overall winner. Matt Hirschman put his #52 on the outside to pass Eric Beers for third late in the race. 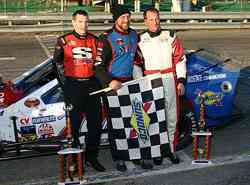 Turkey Derby Winner John Blewett, III (Center) and his racecar is joined by Matt Hirschman (l) and Ken Wooley (R) in victory lane.